A duo of caviar and blinis plus smoked salmon and blinis are simple yet delicious. Photo courtesy CaviarCaviar.com. This is Page 8 of eight pages of elegant seafood hors d’oeuvre recipes. Click on the black links below to view the other pages. 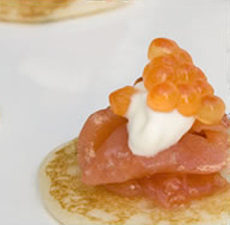 Blini with smoked salmon and caviar is one of our favorite party foods. It doesn’t matter whether you use the most inexpensive caviar or roe or something more luxurious: The outcome is delicious, special and fun. For variety, half of the blinis are topped with smoked salmon, the other half with caviar. This recipe yields 16 pieces for hors d’oeuvre or amuse bouche; or one piece of each as a first course for eight people. Warm the blinis according to the package instructions or in the microwave. 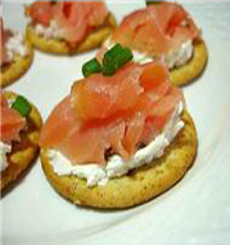 On half of the blinis, lay a small strip of salmon followed by a scant teaspoon of sour cream. Top with a sprig of fresh dill. 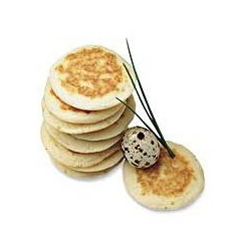 Make up the rest of the blinis with a small teaspoon of yogurt or sour cream topped with 1/2 teaspoon caviar. Arrange on a platter, alternating the smoked salmon with the caviar and lemon quarters. If it’s in your budget, there’s no reason why you can’t combine the smoked salmon and caviar onto one blini. You just need twice as much smoked salmon and caviar. Fully loaded: blini with gravlax and salmon caviar. Photo courtesy CaliforniaCaviar.com. 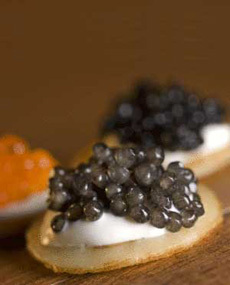 Recipe courtesy Paramount Caviar. All other materials Lifestyle Direct Direct, Inc. All rights reserved. Images are the copyright of their individual owners.